Marissa Mayer’s work as president and CEO of Yahoo starts today; she resigned her position as VP of local, maps, and location services at Google yesterday. She takes over from current Yahoo interim chief executive Ross Levinsohn, who was temporarily given the helm after the May ousting of Scott Thompson. Thompson’s academic credentials were misrepresented in a Yahoo company bio, and in at least one SEC filing, which falsely attributed to him a Computer Science degree. Given Yahoo’s roily recent past — it’s had five different CEOs in less than a year — Marissa Mayer’s appointment has unleashed considerable enthusiasm and a very welcome sense of hope for Yahoo’s prospects. New CEO Mayer, who’s 37 and pregnant, is not only a bona fide engineer, she has a stellar track record in the technology and product arena. During her thirteen years at Google, Mayer oversaw a number of the company’s most successful products including Google Search, Maps, Street View, and mobile Local Search. She is credited with developing Google Search’s uncluttered layout, as well as that of Gmail. 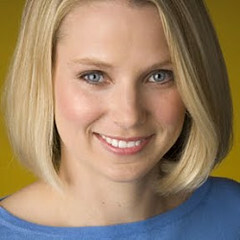 Needless to say, Mayer is being championed as a talent magnet, which will be critical to Yahoo’s chances of revival. It appears that Google bypassed Mayer for a promotion last year, calling to mind another female exec Google chose not to promote: Sheryl Sandberg, who famously left Google in 2008 for a fledgling Facebook, helped transform it into a formidable rival to Google, and made herself a billionaire.